Bill Cunningham once said, “Fashion is the armor to survive the reality of everyday life.” and while at VT, we do see fashion as a way to express yourself artistically, it’s incredibly important to not let it become your security blanket. I invite you to celebrate yourself through style, instead of protecting yourself with clothes and bling bling. Here’s how I found peace with myself through style – I hope it inspires you to step outside of your comfort zone and bring out the reinvented superstar version of yourself. As I approach 50, I’ve entered a stage of reinvention. 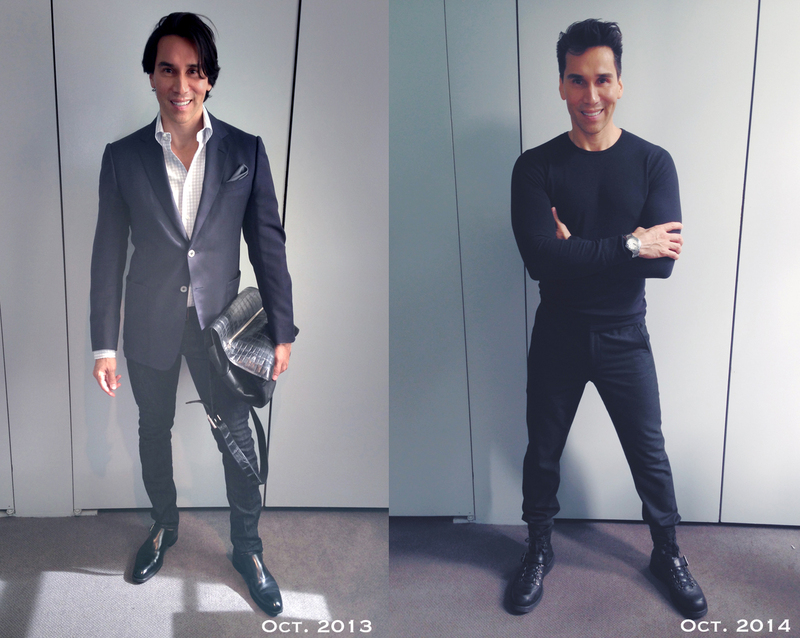 And yes, what you wear and how you wear it can absolutely begin the transformation – from the outside in. For me, it was about making that decision to move away from the classic style type and into avant-garde. When I first moved to New York, I used the classic style type that creates a clean, trustworthy impression to build Visual Therapy with Joe Lupo. Once the business was established, I went from classic to chic, swapping my Oxxfords suits to Gucci and ultimately Tom Ford. Now I’m ready for a new chapter, being more edgy and authentic in avant-garde, and peeling off the layers of my safe place. Through this process, I am finding a new place of external self-acceptance. I feel liberated, and living in that new defined style gets me excited to get out there, do my thing, and push the limits of what’s possible. Classic check shirts have been replaced by modernist Dior and Nauman Piyarji, and Tom Ford Chelsea boot to a military-inspired Prada and subtle, signature spike detail on clean version of Valentino boots. The best thing? You don’t have to give up style for function. You can always find clothes that make you feel like a movie star without torturing your body. Just like clothes, hair is a way to hide what’s really going on inside. Having worn my hair long and on my face for years, I was inspired in Paris and found the courage to walk into a hip salon and chop it all off – shorter than I’ve ever had it before, symbolically ‘unhiding’ myself. There’s nothing more empowering than being comfortable with the more natural version of yourself. For me, it feels more masculine and powerful. The goal in all this is to discover your outer image that will align with your inner self, helping you become the most authentic version and feeling invincible. Call it crazy, but it affects everything from your confidence and well being and how you move through the world, to productivity at your workplace. Style and life are one-in-the-same. Every day on my way to work I see people on the subway and on the streets wearing clothes that send mixed signals, and don’t necessarily reflect who they are inside. Usually those are people who dread their work and aren’t following their passion – I can see it in their eyes. Whoever you are, you can define your style and if you put the time and energy into it, it will pay off. You don’t have to spend a lot of money, and it doesn’t have to happen overnight because we are all a work in progress. You can piece the look together by finding items in your closet that work, and filling in the blanks by shopping sales, as well as places like Zara and H&M. But there comes a moment when it all comes together and that moment is the definition of Feelin’ It. Interested in hiring the VT team to help you define your style and line up your movie star wardrobe? Email us info@visual-therapy.com. Great post, Jesse. Since working together in our mutual Chicago days you’ve never looked better/more “yourself” than you do now!